As we all know, teams have 24 seconds to get a shot off. Some times, teams are successful; other times, they fail miserably. Here at NBA Rookie Class, we plan on succeeding time and time again in bringing you the 24 best, worst, and most interesting things that our NBA rookies did from that day’s games, or the night before. 1) Jonas Valanciunas played like a veteran. 22 points on 9-of-13 shooting from the field, 7 rebounds, 3 blocks, and 3 assists. He made his other foreign Toronto big man Andrea Bargnani look extremely useless, as Bargnani finished 2-of-19 from the field for a total of 4 points. 2) Valanciunas has now issued at least one block in his last five games. The big man knows how to play defense. 3) Some other rookie big men also know how to play defense. 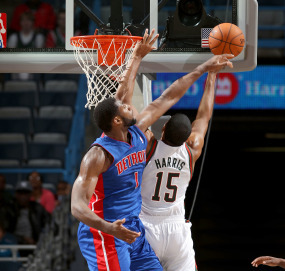 Detroit’s Andre Drummond had three blocks including this nice one against Carmelo Anthony. 4) Drummond still doesn’t have a clue on offense, as he went 1-of-6 from the field, finishing the game with two points. Offensively, he’s just challenged. 5) Drummond’s rookie teammate (or super-rookie) Kyle Singler is far from offensively challenged. Singler finished the night with 16 points on 5-of-7 shooting (2-of-4 3-point, 4-of-5 free-throw) and 3 rebounds. 6) Singler needs to stop fouling. He had five fouls tonight, the fifth time this season that he’s had 4 or more fouls in a game. Too many fouls will start to equal too much bench time, and not enough development. 7) Detroit’s Kim English is ineffective in only four minutes of play, but that’s on the coaching staff for not playing him enough. It’s also difficult to make a difference with only two shot attempts, as well. 8) English should ask the Knicks’ Pablo Prigioni and Chris Copeland, as the two of them know a thing or two about limited opportunities. The two Knickerbocker rookies only had 5 attempts between the two of them in 16 combined minutes of action. 9) Evan Fournier of the Nuggets excelled with his few shot attempts. 2-of-2 from the field; however, it took Fournier 11 minutes to get those looks, showing that the team still isn’t that confident in his abilities. 10) The Orlando Magic also didn’t give 15th overall pick Maurice Harkless many looks tonight. Harkless scored 5 points on 2-of-3 shooting, but the Magic coaching staff must like what they see, as Harkless received the nod to start tonight. Harkless showed his appreciation by contributing on the defensive end with 3 rebounds, a steal, and a block. 11) Andrew Nicholson came off the bench for the Magic, and was extremely efficient offensively: 4-of-6 shooting from the field. Nicholson, however, needs to work on his aggressive nature on the defensive side of the ball so that he too can one day start for Orlando. 12) Playing off the opposing bench, Jared Sullinger scored 11 points and pulled down 6 offensive rebounds. With numbers like that, it seems that Sullinger could be in the starting line-up again very soon. The personal fouls, though, need to be taken care of (4 fouls in 20 minutes of play). 13) Austin Rivers is trying to work his way back into New Orleans’ starting line-up as well. He’s not having much success, however: 2-of-10 from the field with 3 turnovers. Rivers did fill out the stat sheet quite nicely, though: 6 rebounds, 6 assists, 2 steals, and a block. 14) Anthony Davis didn’t play. Again. That doesn’t bode well for his future, as injuries this early can never be a good sign. 15) You know you’re good when someone refers to a night during which you scored 13 points and handed out 7 assists as a “bad night”. Portland’s Damian Lillard did struggle with ball control (4 turnovers) and getting open shots (blocked 3 times), but anytime a rookie point guard can make a heads up play such as this, the turnovers and blocks against become afterthoughts. 16) Lillard also recorded 6 rebounds, 2 steals, and 2 blocks. Even when we try to find faults with his game, he still plays an all-around great game. 17) It’s nice to see Lillard’s rookie partner-in-crime Meyers Leonard getting a few starts. Leonard scored 12 points and added 3 rebounds and a block. Given more time to develop as a young big in the league, Leonard could be recording double-double’s in no time. 18) Only time will tell if several Lillard-to-Leonard alley-oops will be highlighted on this site, but it sure would be nice to see some. 19) All rookies combined tonight posted a -72 +/-rating. Granted, one player can’t be accounted for a whole team, but that number does not look very appealing. 20) At least some rookies played. Detroit’s Khris Middleton, Boston’s Kris Joseph and Fab Melo, Orlando’s Kyle O’Quinn, Denver’s Quincy Miller, Phoenix’s Kendall Marshall, and Brooklyn’s Tornike Shengelia didn’t get to hit the court at all. A few of the aforementioned weren’t even allowed to dress. 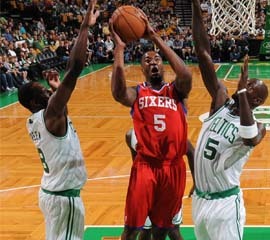 21) Philadelphia’s Arnett Moultrie probably would’ve been better off not playing. He was only given 7 minutes off the end of Philly’s bench, and wasn’t given many opportunities to do anything. 22) Considering Moultrie lead the SEC in rebounds per game last year (not Anthony Davis, as many assume), it’s surprising Philly isn’t giving him more playing time. 23) It’s still surprising that Anthony Davis is out with an injury; it’s not a good sign for longevity in the league. Just ask Greg Oden. 24) It’s even more surprising that this list made it to 24 things…even if this one isn’t extremely official. Thanks for reading. You can comment about any one of the 24 “things”, or bring up something that we failed to mention. We’re always looking for opinions and ways to improve. Also, you can follow us on Facebook and Twitter. How’d the rookies perform last night? Here’s a recap of the best and worst from October 18th.